In life, it's all about connections -- have 'em, and they can get you a job or keep you out of trouble. Don't have 'em, and you must have gone to Trinity. 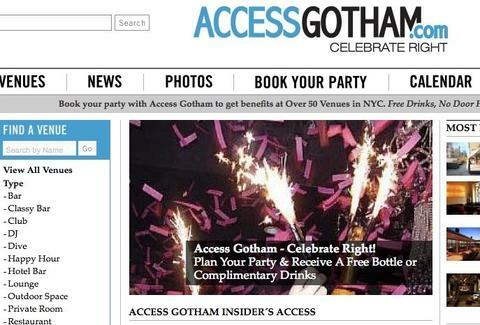 Leveraging their contacts to improve your nightlife: Access Gotham. From a guy who's been building a massive Rolodex ever since entering the event planning business when he was 15, AG's founder recently decided it was time to mine his quarry for the benefit of the masses, and isn't charging them a dime, just the type of business skills you'd expect from someone whose job is partying. Specify your no. of guests (no max or min) and any special notes, and AG's planners'll work with you to find the appropriate venue, then coordinate with the owners and managers to make sure you're "taken care of above and beyond" at the door and inside, which according to your party size includes a reserved table/booth/room/etc, and hooch comps from free rounds, to bottles of champ, to tickets that're good for drinks (you'll still need to rock at skeeball to get that switchblade comb). Kicking off with a roster of 50 partner venues, potential spots are broken down into categories ranging from Casual (King's Cross, Slate, The Ainsworth...) to Club, which includes D'or, Hudson Terrace, and The Gates; if you have a specific vibe in mind, they've also hit each joint with tags like "Suits Welcome" and "Dancing on Couches", though do you really want to risk leaving Lionel Richie by himself on the ceiling all night long? A user rating system's also been implemented to aid your quest, though if you really cared about what other people thought, you probably wouldn't wear that Bantams sweatshirt around.